The Quill or Capture team always tries to do its best, we really do. But for some reason, covering the annual defence/aerospace show in Paris each year always results in many moments of amusement/disaster. So, in the tradition of last year’s Eurosatory top ten, we give you the unadulterated truth about the Paris Air Show. Chaos hit the Pairs Air Show first thing Monday morning – and before the Quill or Capture team even reached Le Bourget. The roads were manic (validating our excellent decision to walk to the site rather than bus it) with the imminent arrival of the French President, François Hollande. Whistles were being blown, traffic was being directed – poorly – and the place was a semi car park. The motorcade that arrived was something to behold. 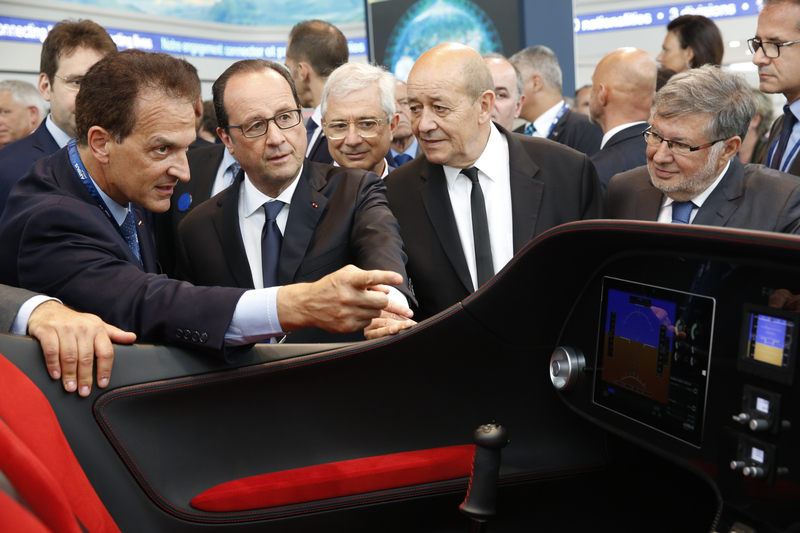 While at the show the madness ensued and one reporter had the misfortune of being at France’s largest defence company’s pavilion as the president swept in. Surrounded by a horde of reporters, TV crew, security, and other hangers-on, he entered the pavilion, had a gander at things and was on to the next thing before you could say Watchkeeper. Then everyone relaxed and resumed normal duties. It was quite the experience – oh, and he’s a lot shorter than he appears on TV. One Quill or Capture staff reporter was on video duties for the air show and managed to make it through most of the week without incident, which is surprising for the reporter concerned. However, a long week running around with camera and tripod eventually took its toll. One of his last tasks of the show was to interview the French Army’s NH90 test pilot. Tired, and a little sweaty, the dishevelled reporter was offered a strong French coffee at the NH Industries’ chalet. It was gladly accepted with the knowledge that it would perk him up for the coming interview. The young waiter handed over steaming hot coffee in a cup and saucer. With one hand gripping his trusty tripod, the reporter excitedly took the coffee in his spare hand. But the sunburn, the exhaustion and dehydration had taken over by this point and in an effort to put the saucer down to add some sugar, the whole thing spilled over the drinks counter. No part of the counter was spared and even the waiter, in his crisp white shirt, was splashed with coffee. It was at this point the clumsy videographer was escorted outside and, safe to say, was not offered another drink. An often under-appreciated perk of the industry can be the after-hours dinners, functions and events where the hacks get a chance to meet industry reps on neutral ground and talk shop. This is a time when reservations are made and people behave perhaps more as they might in the real world, rather than keeping professional decorum foremost in the mind. Now imagine how free one of the Quill or Capture team felt when combining this with the apparent anonymity of dining in the dark. And you might imagine what drove one redoubtable member of the press corps to recite several verses of Hamlet to an unseen but no less present audience, bringing silence to what was once a noisy arena and now hushed with the solemnity usually reserved for more formal occasions. On the final day, the Quill or Capture team made its way back to Le Bourget for a last bit of filming and some schmoozing. While watching the air display and keeping up some social media duties at a company’s media chalet – we won’t name names – life flashed before the eyes of one reporter. A gust of wind had lifted one of the weighty umbrellas from the main chalet next door into the air, did a summersault in the air and proceeded to land right on top of the unlucky journalist. One of the company’s press relations team was at her aid straight away – probably thinking he had just inadvertently sacrificed a reporter to the air show gods. The poor reporter had a bit of a fuzzy sensation, but on reflection can’t be 100 per cent sure that was the knock to the head or the champagne. Among the multi-billion dollar orders, new programme launches and innovations on display at the Paris Air Show, for the discerning journalist there were also some important questions to answer. Which company has the best media chalet, who is providing the best breakfasts and where is the best place to steal a moment with a glass of wine? Normally a tough category but made a lot easier this year by the number of companies which stayed away. The Quill or Capture team sampled many chalets during the week but for the sheer ability to always find somewhere quiet to work, the award goes to Thales and its well-catered chalet right on the flight line. Another one that is normally hotly contested but that saw fewer serious candidates vying for the top spot this year. The runway winner was Bell Helicopter and its bacon and sausage bap, complete with English brown sauce – although this did result in our esteemed editor doing his best Ed Miliband impression during the interview with Bell CEO John Garrison. After a week of rich French food, you start to crave something a little spicy. The organisers of the Singapore Air Show provided the solution in their chalet in the form of an amazing Asian spread. Sometimes noodles are the best answer. While we can’t say we sampled every bottle available on ever chalet (hic), the selection at the CAE chalet was ‘pretty impressive’, in the words of Quill or Capture’s resident wine expert. The selection included an amazing Grand Cru Classe Bordeaux, a bottle of which is now securely stashed in the bottom of one editor’s wardrobe.